It has been two years and almost fifty movies, but we’ve finally stumbled onto one starring the ubiquitous Holiday Movie actress, Candace Cameron Bure. Did you know that she’s Kirk Cameron’s younger sister? I did not know this. Possibly because I was unaware of this young lady’s existence before a few days ago. Nice to meet you Ms. Cameron Bure. Kate and Chris (Bure) are twin sisters leading two very different lives. Kate is a single, high flying real-estate executive living in a downtown Denver penthouse, while her sister Chris is a high school teaching divorced mom of two, living about an hour away in the suburb of Littleton. Oddly enough, the twins don’t see each other much. I was going to say because it’s more cost effective, special effects wise, to keep the twins apart but I gotta say this movie did a phenomenal job of seamlessly putting Both Candace Cameron Bure’s in the scene at the same time, quite a few times. Anyway, their dad (Walter Platz) hoodwinks the sisters into brunch together, where each one trashes the others life, Prince and the Pauper style, with each one thinking the other sister’s life is cake. I like cake. You know what? They did the whole ‘identical twin identity switch’ when they were kids, to disastrous results, why not do it as adults! What could go wrong? Love is what could go wrong! Chris, as Kate, almost immediate falls for Kate’s hunky, perpetually grinning workmate Greg (Mark Delkin), where Kate, as Chris, falls for the wealthy divorced father Tom (Eion Bailey). About that… Kate had a crush on Tom way back in the day, but Tom stood up teenage Kate for some reason. More twin shenanigans that we won’t get into. Turns out each sister learns that both of their lives are very difficult, and they have rediscovered their love for each other, but more importantly, they have each found a man! At Christmas! Kind of! As soon as they tell these men who they really are, which could derail the love, probably should derail the love… but it won’t. You know, I can’t think of anything really bad to say about this movie, mainly because saying something bad about ‘Switched for Christmas’ would almost be mean. The movie itself is nice and sweet, every character in the movie is nice and sweet, and Ms. Cameron Bure infused both of her sister characters with a niceness and a sweetness, but still making them different enough to tell apart… until the end where I kind of lost track of who was who. That’s probably more on me though. I don’t know if the sweeping sweetness of this movie is an issue or not, as having watched a string of Royal Christmas Movies which all at least gave us one villainous character, but ‘Switched at Christmas’ didn’t really feel the need to go down that path. Good for them. The Christmas vomit worthiness is pretty decent as well. Lots of snow, canned Christmas music, plenty of Christmas background elements, A Christmas cookie baking scene complete with Fake Kate and grinning dude playfully throwing flour at each via musical montage… which made me throw up in my mouth repeatedly… and Fake Chris shamelessly buying Christmas cookies like a normal person. The overall theme wasn’t very Christmassy, being as the switch could’ve happened on Valentine’s day or Halloween and still had the same effect, but the inherent sweetness of all the characters is more than enough to throw an extra vomit in there for posterity. 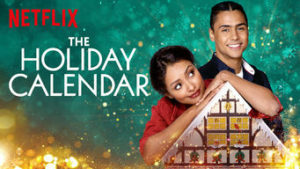 Look, under normal circumstances, I wouldn’t watch this movie on a bet, but for those who do watch these kinds of movies, this one is an example of the Hallmark Christmas Movie Machine in fine form.